The digital signage industry is expected to reach 6.9 billion dollars in 2025. Digital signage companies know this and are innovating for a higher share in the market. Every year these digital signage companies showcase their latest technologies at Digital Signage Expo (DSE). 22MILES has been a regular attendee at DSE for the past few years. Last year, 22MILES won the Rave Pub’s Best New Digital Signage Application Award. This year, 22MILES focused on showcasing augmented-reality wayfinding, an agile room booking solution, and its ability to support all hardware and operating systems. 22MILES was the official sponsor of the DSE 2019 app. This app can be downloaded in the Google Play Store or Apple Store. The iOS version featured the augmented-reality (AR) wayfinding plug-in. The AR plug-in enables your phone’s camera to show you turn-by-turn directions in real-time environments. 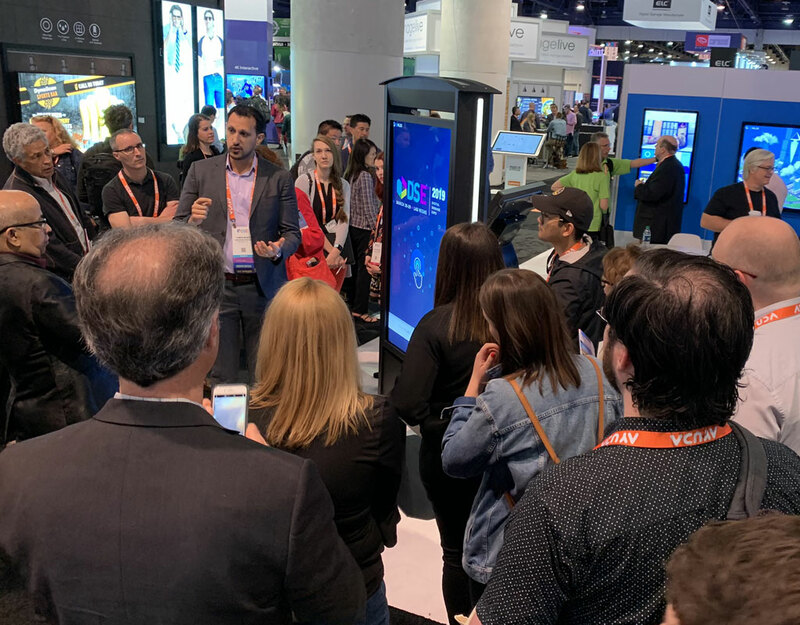 At DSE 2019, users were able to follow along a super-imposed pathway generated on their phone to find session locations and exhibitors. 22MILES is showing the industry that it is ready for any type of digital application. 22MILES featured a 1×4 video wall that was wirelessly controlled via an iPad. Through this solution, the iPad controls the video wall to showcase video applications, menus, room booking, and more. This is a built-in feature in 22MILES’ CMS Publisher Pro. If you’d like to learn more about the features mentioned above, contact us for a free demo!